I love Dr. Martens, but for some of you divas they may be a little too grunge. I understand, that's why when I saw these I had to post them. These boots I found at Forever 21 are a fabulous and less expensive alternative to Dr. Martens. Plus they have studs, and you know how I feel about studs (love em!). They look similar to a pair of vintage boots by BESS that I saw online for over $300! These retail for $32.80, so you can try the trend on the cheap and see if it works for you. 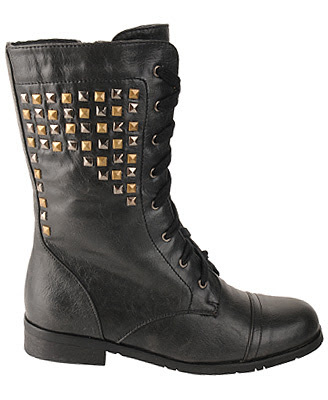 Less bulky than your normal military boot, these would look hot with leggings and a cargo jacket. Pick up a pair fingerless leather driving gloves and you will be styling on em. The cool girl rules for spring!